Proving that you can't go wrong with an iconic look, the Cortez features a herringbone outsole for traction and durability. The wedge EVA midsole provides updated comfort that won't weigh you down. Nylon, leather, and/or suede upper for premium style. Nike iD Nike Free RN Flyknit Women's Running Shoe Size 9 Grey Red White. Condition is New with box with no lid. Shipped with USPS Priority Mail. Heel is rounded to roll with the ground, promoting a more natural range of motion. Injected unit sole (IU) foam is tough enough to double as an outsole, dramatically reducing the shoe’s overall weight. I don't use filters, or low lights or dark backgrounds, or far away photos, all its clearly detailed for ya! I truly hope we can work out a deal! Nike Epic React Flyknit 2 Women's Running Shoes. Sizes 7.0-9.5. Multiple Colors! New without box. Shoes may have been tried on but not worn. 100% Authentic. Power through your next run in the Nike® Free RN Flyknit 2017 shoes for premium support and lightweight cushioning you can count on mile after mile. An auxetic outsole adjusts to every step so you have flexibility and support with every wear of the Free RN Flyknit 2017. As much as I try to avoid them, they do rarely happen. The Nike Free TR Flyknit 3 AMP is imported. Nike FREE TR Flyknit 3 AMP Training Shoes. Flywire cables for enhanced lockdown through the midfoot. 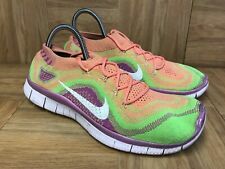 WOMENS NIKE FREE TR FLYKNIT 3 AMP SNEAKERS STYLE # AA1212 005 CONDITION : BRAND NEW WITH BOX. MSRP : $130.00 COLOR : ATMOSPHERE GREY SIZE : 9 USPS PRIORITY MAIL SHIPPING (1 -3 DAYS) 30 DAY RETURN POLICY.